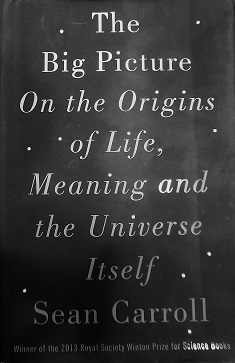 Part 2 of my review of the book: “The Big Picture: On the Origins of Life, Meaning and the Universe Itself,” by Sean M. Carroll. Part 1 is found here. “We have two goals ahead of us. One is to explain the story of our universe and why we think it’s true, the big picture as we currently understand it. It’s a fantastic conception. We humans are blobs of organised mud, which through the impersonal workings of nature’s patterns have developed the capacity to contemplate and cherish and engage with the intimidating complexity of the world around us. To understand ourselves, we have to understand the stuff out of which we are made, which means we have to dig deeply into the realm of particles and forces and quantum phenomena, not to mention the spectacular variety of ways that those microscopic pieces can come together to form organized systems capable of feeling and thought. The latter he must say because later he says that the material world is all there is. He argues that there is no such thing as a spirit or a soul that is not part of our material body. When we die that is it, there is nothing beyond life. Carroll is a student of many philosophers, mostly atheists, or who are at least those who challenge a conservative Christian worldview of life. For example he mentions, Descartes, Nietzsche, Laplace, Hume, Leibniz, Spinoza, Lewis (not C.S. ), Russell, Wittgenstein, Kierkegaard and others. But it would seem that the author relies more strongly on the so-called Enlightenment philosophy of the atheist Scotsman David Hume.